Creating the wedding of your dreams begins with the perfect wedding stationery — a beautiful bundle of papers that holds the most important details of your magical day. If you are looking for something special that excites your guests and paints the perfect picture of your event, then you have come to the right place. We devote ourselves to understanding the inspirations of our clients in order to create pieces that will be forever loved and cherished. Our two-person team consists of a passionate designer and a devoted client coordinator. This allows us to offer a level of service that can’t be found anywhere else. The process begins with a complimentary consultation where you share your inspirations, visions, and favorite color palettes with the designer. She then brings your ideas to life with beautiful, hand-drawn artwork that is completely unique to you. Once approved by you, your invitations are printed on soft uncoated paper using a high quality digital press and paired with accessories to match. Meanwhile, our client coordinator keeps the project organized and running smoothly. She oversees every aspect of the process and is always available to answer your questions. 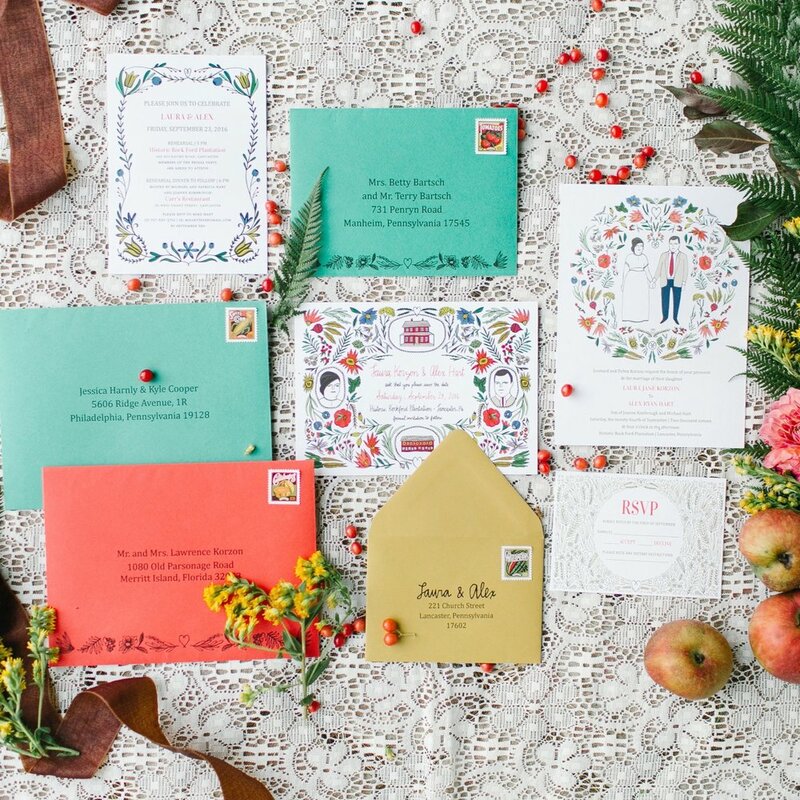 Every last detail — color palettes, illustrations, font selection, papers, and envelopes — is completely custom and requires planning, research, and careful attention. Because of this, we are accepting a limited number of projects this year. If you are interested in working with us, we recommend beginning the process early. Please visit our website to complete a simple questionnaire and request a complimentary consultation. We look forward to working with you!